If you want to join the keto big leagues you need to start by mastering the fundamentals and it doesn’t get any more fundamental than bacon. Bacon is the backbone and foundation upon which all worthy ketogenic and low carb diets are built. With this method say goodbye to clean up, constant flipping, and undercooked spots, and hello to perfectly cooked bacon that you can finally cook shirtless again without getting bombarded by splattering grease. So it’s time to step up your bacon game by utilizing the patent pending Maximum Efficiency Bacon™ method. Tear off two sheets of parchment paper, one for the baking sheet and the other for the plate. 4. 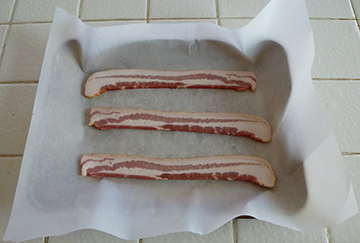 Take bacon out at desired doneness, use any utensil on hand to transfer to the plate, save the grease (or not), and throw the parchment paper away. Grease won’t pass through the parchment paper so there’s no clean up!